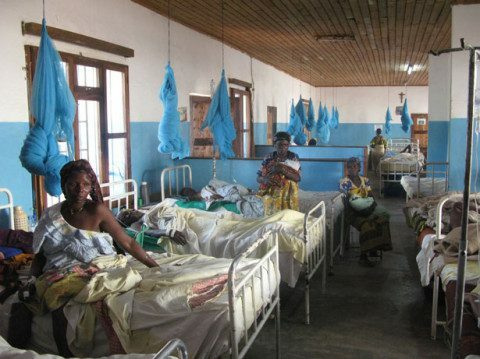 The Ntiamoah Foundation, a Non-Governmental Organization has donated items worth GHS 50,000.00 to the maternity ward of the New Abirem government hospital as a way to wipe out maternal mortality in the area. The items include; pulse auxymeters, trolleys, gloves, bed sheets, Adult and children weighing scales, LED television, swivel chairs among others. In a short ceremony held at Abirem to present the items to the hospital, Mr Robert Kwaku Appiah Asante, the Founder and the Executive Chairman of the foundation said his major priority was to improve quality health care delivery to the people of Abirem hence his tireless efforts in elevating the then health centre to a district hospital. This, he added was made possible with the help of the Ghana Hope Foundation, an international non- governmental organization based in America and the Newmont Akyem Golden Ridge Limited. He expressed satisfaction at the significant improvement of the hospital, most especially the magnificent buildings put up by Newmont as well as operation tables, state of the art electric beds and mattresses donated by the foundation for the past decade. Mr Asante added that, the foundation for years had been registering over 1, 304 people onto the National Health Insurance Scheme (NHIS) to enable them access quality healthcare delivery. To improve quality education in the area, he hinted that over 107 people had been awarded scholarships to pursue different courses in the university, training colleges and the Senior High school level. Mr Atta-Larbi Sekyi, the Medical Superintendent of the facility commended the foundation for the significant strides it was making to lift the image of the hospital to a befitting standard. He mentioned inadequate staff and furnisher in the hospital, poor road network and lack of incubator to be the major challenges the facility was facing at the moment. He therefore pleaded with other NGOs, philanthropists and the government to provide the facility with an ambulance to aid their movement. Obrempong Kwesi Amoh Kyeretwie I, the Chief of Abirem and the Acting Kotoku Gyaasehene of the Akyem Traditional area commended the Ntiamoah Foundation for lifting the image of the facility to a hospital level. He entreated the professional health workers especially those at the Maternity ward to make good use of the items to help minimise the high rate of maternal mortality in the area. Obrempong Amoh Kyeretwie therefore cautioned them to adopt the spirit of proper maintenance to ensure that the items provided them were been taken care of. A citation, after the programme, was presented to Mr. Robert Kwaku Appiah Asante, the Founder and the Executive Chairman of the Ntiamoah Foundation for his immense support in bringing development to the people of Abirem through his hard work, dedication and commitment.